The HTC Sensation 4G is the new flagship of T-Mobile's fleet of top-notch Android phones. I found a lot to like about the Sensation during my review, and had few quibbles. The HTC Sensation is a great phone that should appeal to almost anyone looking for a smartphone on T-Mobile. The amazing thing about the HTC Sensation is how small it feels, even with its 4.3" display. The Sensation's narrow bezel and slim profile make it almost as comfortable to hold as the 4" Samsung Galaxy S 4G. The HTC Sensation is also light, at only 5.2 ounces, yet feels solid. On the back are textured panels on the top and bottom to provide additional grip. The volume rocker on the top left side is easy to access, though a little too smooth and narrow. Likewise, with the top power button. 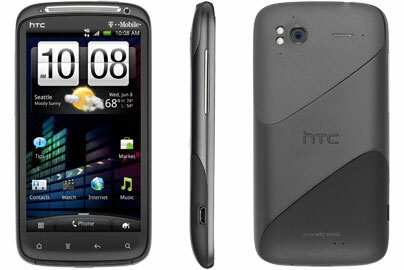 The HTC Sensation 4G has a high-resolution 4.3" qHD(540 x 960) display. It is bright with natural colors and great resolution, though colors are not as rich as the Super AMOLED displays on the Samsung Galaxy S phones, nor is the viewing angle as good. It was difficult to read in bright light. When I recently reviewed the Motorola Atrix with a 4" qHD display, I found that text appeared smaller in menus and most apps, which challenged my 40-year old eyesight. I didn't find this to be as much of an issue with the HTC sensation thanks to its slightly larger screen. The built-in speaker on the Sensation wasn't stellar, sound was a little muddy though it did its job. Call volume was also on the quiet side. The Sensation offers HDMI out through an optional MHL adapter and you can stream photos and videos wirelessly through DLNA (assuming your TV supports DLNA, as well). T-Mobile touts the HTC Sensation as a 4G phone. In my testing, T-Mobile's 4G network is faster than its 3G network in New York City, delivering typical download speeds of around 3Mbps and upload speed of 1.7Mbps. But that is far slower than Verizon's LTE network, which consistently delivered download speeds in the 18-20Mbps range (see: The Fastest 4G? It's No Contest). The actual web browsing experience on the Sensation was excellent. Pages rendered and scrolled quickly and Flash content displayed properly. I also appreciated the 4.3" size and qHD resolution, which let me read text even when viewing web pages at full width. Web videos played smoothly and looked great. The HTC Sensation can act as a mobile hotspot for up to five devices. The HTC Sensation has an 8MP rear-facing camera that does a very good job in bright lighting conditions, with plenty of detail. But as things darken, pictures become noticeably noisier and detail is quickly lost. The Sensation also has a problem with reds, shifting them towards hot pink. HTC's anti-noise processing also undoes some of the benefits of the 8MP camera by smoothing out areas of photos with similar coloring. This was a problem we first noticed in our HTC Flyer Review, where it severely affected picture quality. On the Sensation, you won't notice it when viewing photos on the phone, but if you enlarge or crop your photos, these patches of lost detail become obvious. On the front there is an unimpressive .3MP VGA camera—a surprising shortcoming given the 8MP camera on the rear. But unless you're big into video chat, it probably won't matter to you. Thanks to its dual 1.2GHz processors, the HTC Sensation easily handles 1080p video recording, with no stutters or jerkiness. Video becomes shaky when the phone is moved, so best to keep it steady while shooting. Video quality suffered quite a bit in low light, and the Sensation had trouble focusing, but it was still better than most other smartphones out there. The HTC Sensation 4G runs Android 2.3 Gingerbread and a new version of HTC Sense that provides some welcome enhancements to the user experience. Chief among these is the ability to add four shortcuts to your favorite apps on the lock screen. To open an app, you simply drag its icon into a ring on the bottom of the screen—very convenient. The lock screen can also be customized to show your photo album, weather, stocks or a number of other helpful widgets. General navigation was very quick, with no noticeable lag. Apps opened quickly, though the HTC Sensation was actually a hair slower than the Samsung Galaxy S 4G, which is only running a single core processor. The keyboard is well spaced and HTC provides their own version of Swype, called "Trace", that lets you quickly enter words by sliding your finger across the keyboard. Battery life on the HTC Sensation was very good. It frequently lasted me through the day and into the next with occasional usage. The HTC Sensation 4G is available for $199.99 from T-Mobile with a new, two-year customer agreement. Or you can pick it up from AmazonWireless for $179.99. The HTC Sensation 4G would definitely be on my short list of phones to consider. It's the first 4.3" phone that is actually comfortable for me to use and fits well in my front pocket. And that display is very pleasant to look at, even if it may not have the brightness of the Samsung Galaxy series. The new HTC Sense interface is very well thought out, and the lock screen features are both convenient and fun. I have a T-Mobile G2 phone, which I really like, but my wife is stuck with the older MyTouch 3G Slide. I’d like to give her my G2 and upgrade my phone, but these devices are improving so fast that I’m not sure when I should jump in. I’m trying to hold off until the next consensus big thing hits, but every time that phone is out, it seems that the next powerhouse is just a short month or two away. I might just get whatever the next Nexus phone ends up being. I finally got to play with the phone for a little bit yesterday and loved it. It feels so much smaller than I imagined. Sense 3 was nice, and I could see myself purchasing this device sometime soon. Unfortunately I didn’t get a chance to check out the camera… Soon! I had an old Canon Powershot G1 that did the same thing with bright reds - it turned them all into bright pinks… but if you shot in RAW, then it was fine… so this problem is likely related to the jpeg compression scheme employed by HTC….unacceptable, but hopefully software upgradeable….